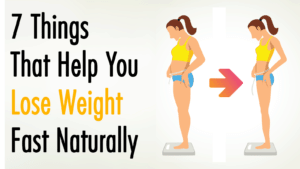 Doctors always emphasize that diet and exercise are the most effective natural methods to lose weight. Experts say that if you want to improve your health, then you’ve got to work hard at it with a good workout and meal plan. These methods, however, require months and years of discipline and commitment. But how do you lose weight fast without diet or exercise? Is this even possible? Yes, you can lose weight without dieting. 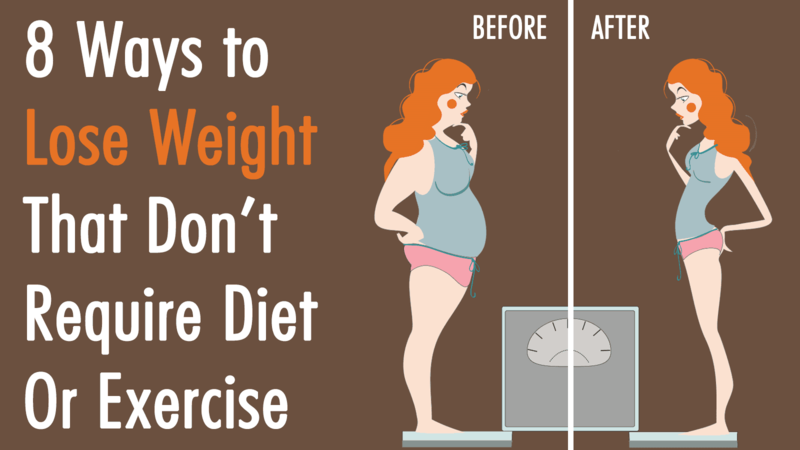 You can lose weight without exercise. You can lose weight without going to the gym. Sounds too good to be true? If you’re having a challenging time with exercise and tough diet plans, then here are some tips that will help you lose weight without dieting or exercising. Apparently, how fast or slow you eat affects your weight. Experts from Japan found out in a study that fast eaters were likely to gain pounds faster compared to slow eaters. Their findings proved what dieting advocates have pointed out for years that if you chew and eat your food slowly, you’ll feel fuller. You’ll decrease snacking in between meals as well. Probably the easiest way to lose way without dieting! If you want to lose weight without exercise, change your plate. Use a smaller plate to portion your meals. This trick applies the concept of the Delbeouf Illusion that controls your brain’s perception. In one study published in the International Journal of Obesity, experts learned that following the Delbeouf Illusion elicited positive effects on people trying to lose weight. The idea behind this concept is this: if you portion less food on a large plate, your brain might perceive that you won’t be full. So, you would tend to add more servings (and more calories) to your meals. But if you use a smaller plate, you can trick your brain into thinking that you’re eating larger portions. In this way, you prevent overindulging in unhealthy meals. If you want to know how to lose weight fast, remember that drinking more glasses of water before your meals can reduce hunger pangs. In a study published in the journal Obesity, a group of middle-aged and older adults, who drank at least 17 oz of water 30 minutes before a meal, lost weight more effectively compared to those who did not change their water intake. Water helps cut down your calorie intake as well, especially if you avoid drinking soda or juice. Wall colors with yellow and red undertones can influence your appetite and trigger your brain to eat faster. It’s no wonder why fast food chains, such as McDonald’s, KFC, Pizza Hut, and Burger King, have yellow or red colors for their brand. It’s a deliberate attempt to make their customers eat more. So, why not repaint your dining room with blue undertones? A person’s appetite apparently responds less to this color. This is why weight loss experts also suggest using blue plates to eat on. While you’re already making changes by repainting your dining room, why not consider changing the lighting fixture to something brighter? A study from the Cornell University Food and Brand Lab showed that people who ate in dimly-lit dining areas or restaurants were more likely to have 39 percent more calories in their meals. They also went for less healthy foods, more fried dishes and lots of desserts. Those who ate in well-lit places, on the other hand, were prompted to choose vegetables, and grilled or baked food. The experts said that bright lights keep people alert, so they can make healthier choices on what to eat, making it an excellent way to lose weight without going to the gym! Writing down what you’ve eaten in a food journal could aid in weight loss, as it will help you pay attention to what you’re eating, according to experts at the Fred Hutchinson Cancer Research Center. In a study, women who consistently kept a food journal to jot down what they ate (and the portions) successfully lost six more pounds than those who did not keep a journal. When you’re not getting the right amount of sleep or experiencing constant sleep disturbances, the hormones that regulate your appetite (called the ghrelin and leptin) could be disrupted as well. A lack of sleep also raises your cortisol levels, which elevates body stress. These two factors trigger food cravings and an increase in appetite. You’re likely to eat more high-calorie food when you’re feeling sleepy too, because your brain thinks you need more energy. What you really need is a good rest, so be sure to get six to eight hours of sleep at night. Maybe you got a box of chocolates as a gift or bought a more high-calorie snack than you intended to indulge on. Not to worry; you’re not supposed to consume those right away. But if these foods are visible and accessible, then you’re likely going to have more unplanned snacks. 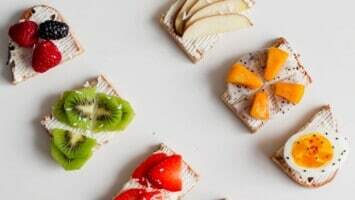 So, experts suggest storing these snacky foods in places where you won’t be able to see it constantly – like on the higher shelves of the cupboards. Instead, keep healthy snacks like apples on your dining table or kitchen counter so that this is what you’ll reach for when you have the cravings to snack. Losing weight is never easy, but be positive. If you start making a few simple changes now, you’ll notice how quickly it will affect your quest to better health. While it’s not easy, it’s not impossible to lose weight without dieting and exercise. So now if someone asks you how to lose weight fast, you can share these tips with them and start a chain reaction! Remember, with positive thinking you can achieve your weight loss goals!